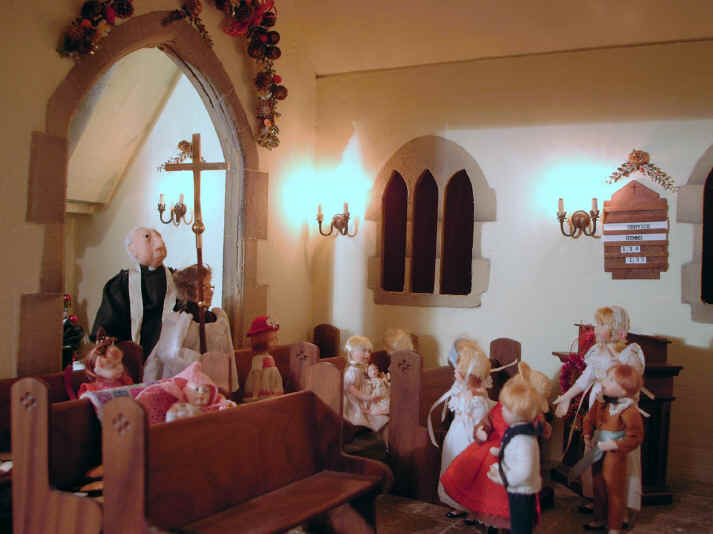 The Reverend Kenneth (always called "Rev Ken" by the children - and with MUCH affection too) arrived at St Hilary's church in September 2004 after poor Reverend Ponsenby-Smyth had decided he needed someone to come and help him. It was very fortunate that the bishop agreed to the vicar's request and asked Rev Ken if he would like to come and be the curate. A curate is a priest who has only recently been trained at theological college. The vicar or rector of a church looks after the curate and helps him learn how to be a parish priest. When a curate leaves a church he may be appointed as a vicar or rector at his own church or he may become a curate at another church if he or she still wants to learn more. See Rev Ken making his very first grand entrance to St Hilary's at the beginning of his very first service!! Goodness me! What ARE the children staring at? Ben, Megan, Alice, Tom and Adele are certainly transfixed by something! This must be something really special and different because they are normally sat quietly in the pew waiting for the first hymn. Ah! This is what the children are witnessing. No wonder they are so spell bound! Rev Ken has brought with him a processional cross to be used in the services at St Hilary's. A processional cross is always carried by the first person in the procession which includes the vicar, curate as well as a choir if there is one. Everybody always stands when the procession begins. In some churches people in the congregation will even bow as the cross goes past them. This is because they believe that the cross represents Jesus Christ, the son of God and they are giving Him respect by doing so. What has happened to poor Poppy? She looks as if she is about to fall asleep! All the children are now ready to stand up and watch the procession! The vicar is processing behind the Rev Ken. 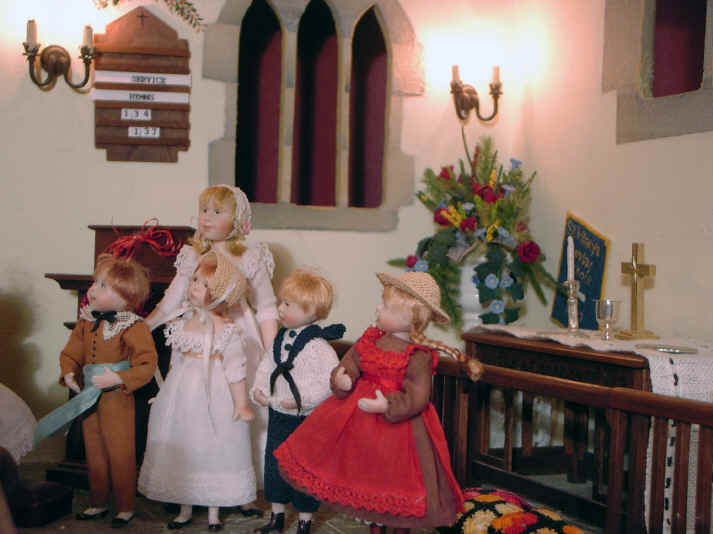 We hope that the children DO remember to stand up very soon AND that Alice, Ben, Tom, Megan and Adele remember to go to their places in the pews. "rector" is just another name for a priest who is in charge of a church. 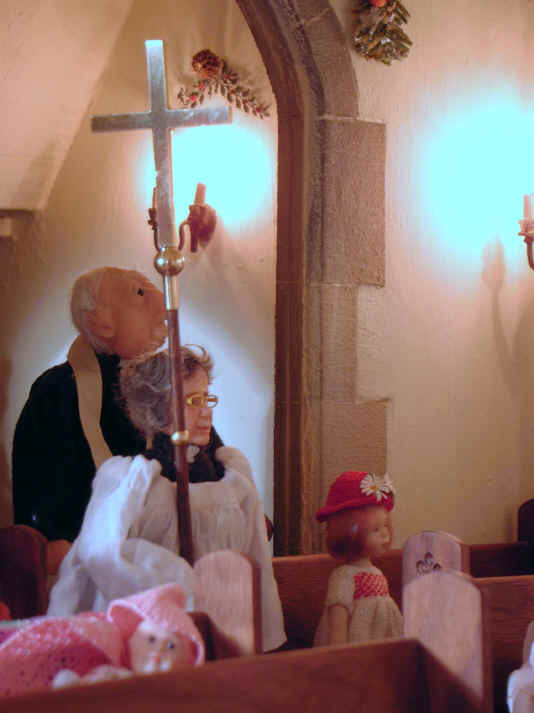 Bowing at the cross is usual in high churches in the Church of England as well as in Roman Catholic/Orthodox churches.